Mike Mills is a graphic designer who has been taking active part in the graphic and film scene since the 90s, working also for “x-girl”, CD jacket designing, and so on. 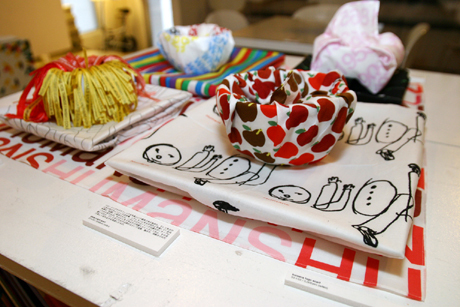 His design project since 2004 “HUMANS BY MIKE MILLS” finally arrived at Sapporo “SOSO” after the collection stopped in Zurich, Milan, Tokyo, and many other cities in the world. It was a quite happy month to enjoy his works for his fans of course, and even for those who don’t know Mike Mills well. I mean by “those who don’t know him” that his works were even attracted people who happened to pass by chance. Because I guided a woman who said, “I’ve been watching because the color was somehow beautiful”. As for me, reading a material, I found an album “Butter08” I had been charmed by the graphic of its jacket, and that Mike Mills participated in it as a bassist. It seems I have been falling in love with the charm of his work from almost ten years ago. This first collection in 2006 was formed mainly by works from “HUMANS 02”. 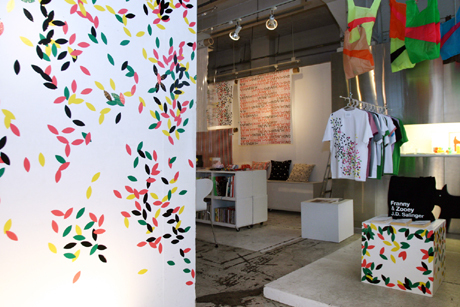 The style and the content of the exhibition were left to each shop, and “SOSO” had “mark’s paper ribbons” at the door and the graphic from the textile “elm leaf” on the wall as an original. I happened to notice a bag with the logo “Franny and Zooey” which was the title of an actual book by Salinger. What is this? It was an introduction to make us have a presentiment that seemed not just to be an exhibition of his works. This exhibition had not only works produced by Mike Mills. There were also music and films from his favorite artists, a notebook to write down ideas, and so on. You can see the “Source of Mike Mills” and get these items if you want to use or know about it more. At the same table, there was a display with a bowl and plate used in the cafe. A unique proposal was performed covering tableware with a colorful scarf, cloth, and ribbon. 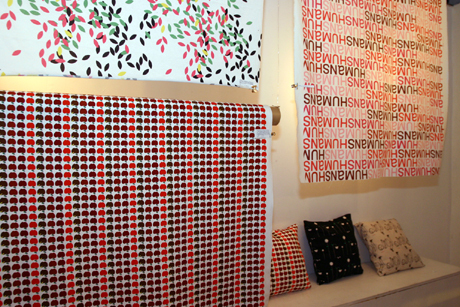 Textiles with various materials and design were hung up to exhibit. It is up to you to decide how to enjoy the textiles exhibited like posters. What do you make with it? A skirt might be cute idea? The “elm leaf” or “brokenman” seemed to be good for childrens’ clothes. To think these kinds of things is also a fulfilling way to spend time. 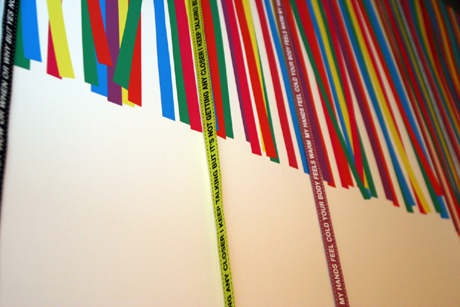 The “mark’s paper ribbons” became a large-sized poster cooperated by PRINT’EM</A, which was on sale as a "SOSO” original item. The exhibit was in solid style with several real ribbons. 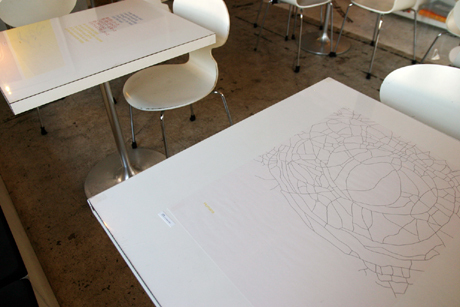 The other graphics in posters were exhibited on the wall or on tables in the cafe. What Mike Mills produces is “what to make people think” and “what to be used in everyone’s life and to live with” His thought must have reached me too as I felt it would be natural to have his works in my room. In this connection, “HUMANS BY MIKE MILLS” website shows all his collections ever, blog by himself, and also the information of further collections in the world.